Upon seeing a recipe for Orange Maple Cornmeal Muffins, I sensed we might have a winner. And win we did, with fruit-flavoured results that left kids asking for more. Starting a Monday morning with miniature donuts made from muffin batter was a fun change of pace. Though I was out of eggs, Poppy’s delicious recipe required none. This version also made the best possible use of the orange juice and yogurt from the back of my refrigerator, which needed to be used up soon. After starting to eat these donuts, I made another half batch, using an almond milk and vinegar substitute for the yogurt. These tasted all right with the tangy cranberries, but were not quite as flavorful as the first batch with fruity yogurt. So if you can eat dairy, go for the fruity yogurt. If you need a vegan recipe, try soy yogurt. And if you have neither, almond milk and vinegar will suffice. Do not let the lack of a donut pan stop you from trying these, since the batter is meant for muffins or mini muffins as well. Combine flours, salt, baking powder, and baking soda in a mixing bowl. In a separate bowl, whisk together yogurt, oil, orange juice, maple syrup, vanilla, and brown sugar. Add dry ingredient mixture to wet ingredients, stirring until just moistened. Fold in chopped cranberries. Preheat oven to 350 degrees F (180 C). 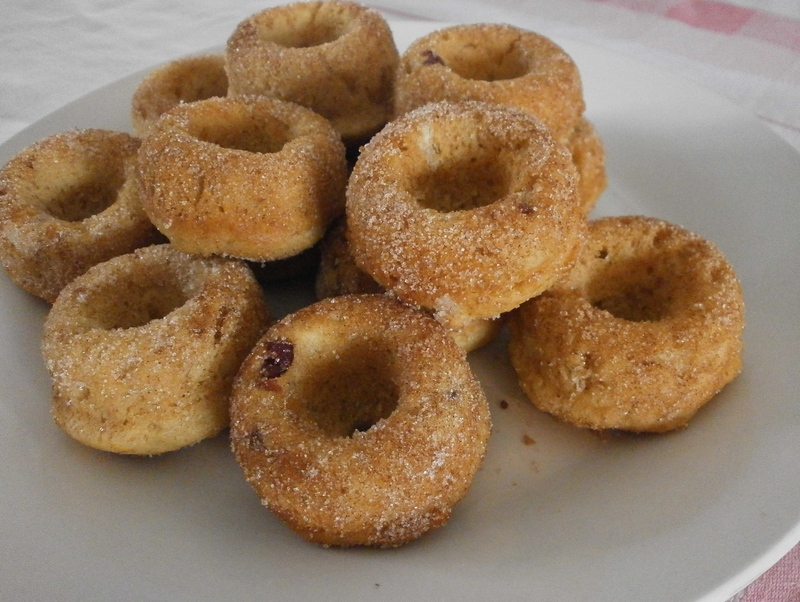 Grease a mini donut or muffin pan with margarine. Fill donut molds or muffin cups 2/3 of the way with batter. Bake for 10 to 12 minutes, or until golden brown (regular size donuts or muffins will take longer). Meanwhile, mix together sugar and cinnamon in a small bowl. While donuts are still warm, spread tops with margarine and carefully remove from the pan. 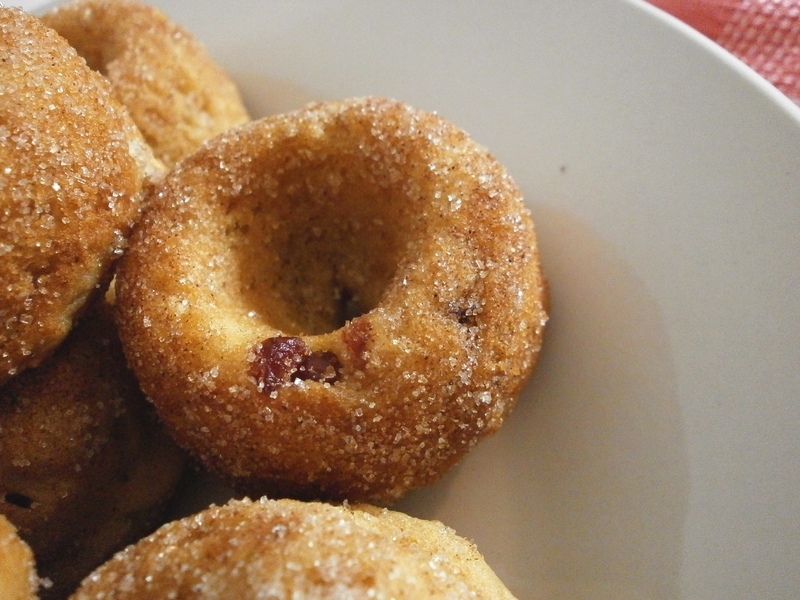 Dip each warm donut in cinnamon sugar or both sides. Serve warm or on the same day as baking. This recipe is linked to Tuesday Talent Show and AP Tuesday. These look delicious! Great blog! Mmmmm yum, now i am craving donuts 🙂 I haven’t eaten one since was a teenager. Orange and Maple Donuts sounds fantastic!! Thanks for linking up to Saturday Dishes. Thanks! I need to make them again soon. Looks really good. The combination of flavours must be really aromatic. Yes, the donuts are especially good fresh from the oven!